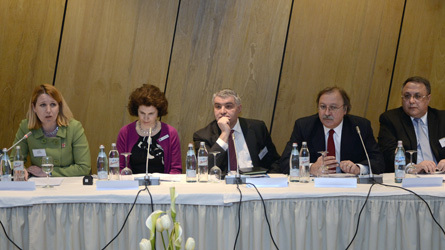 Wilton Park’s conference on Security in the South Caucasus, was this week opened by Georgian Foreign Minister, Grigol Vashadze in Tbilisi. Supported by the FCO in partnership with the Georgian Ministry of Foreign Affairs, Mr Vashadze said “Today, we have a chance to win the peace in the South Caucasus region. Beyond the intractable conflicts and lurking threats, the three nations should focus on progress and development. If we manage, we will resolutely win the peace”. He went on to say, “Continuous progress and reform demands regional order and stability, while aggressive and irresponsible steps will surely endanger our fragile peace. We must avoid this. As you all know, one can wage a war alone but it takes many to uphold the peace”. The Deputy Foreign Minister of the Republic of Armenia, Ashot Hovakimyan, and Ambassador at Large, Yashar Aliyev from the Republic of Azerbaijan, set out their respective positions on regional conflict including the disputed region of Nagorno-Karabakh. The British Ambassador to Georgia, Judith Gough, spoke of Britain’s work in promoting conflict resolution in the region saying “Security in the South Caucasus matters. What happens in the EU’s neighbourhood has a direct impact on the EU. It is in all our interests to have strong, prosperous neighbours. With this in mind, the UK continues to look at building trust and workable solutions through dialogue, diplomacy and practical assistance”. Over 100 conference delegates are taking part in the discussions over the two days which aim to explore policy options to develop conditions for safeguarding security in the South Caucasus. Those experts taking part in the discussions include a number of Ministers from the Georgian government, key representatives from the UN, EU, OSCE, Council of Europe and World Bank, and senior diplomats based in the region. In addition, a strong cohort of conflict resolution experts from international NGOs and think tanks will contribute their expertise. The conference takes a comprehensive approach, addressing strategic and regional security concerns, but also including wider discussions on economic security, energy security, regional democratisation, intra-regional relations and the role of the international community.